Public aquariums held a special fascination for me as a young boy. Entering the darkened corridors with their glowing panels of glass, I saw creatures that were alien to my terrestrial mind. Many of them moved without legs, an act I could only crudely imitate after much practice; most fueled that movement by breathing water, an act I knew after my first accidental attempt I could never imitate. Their faces, mute and unexpressive, stared at me through the glass, while I stared back searching for a sign of awareness or emotion that I could identify. They were citizens of another world utterly beyond my experience, unfathomably old, mysterious, and yet somehow familiar. Growing up in southern california on the edge of the Pacific Ocean, I entered this world as often as I could. In the beginning I remember going to the beach, fresh from swimming lessons in the neighborhood pool, diving beneath the waves and simply opening my eyes. Fish hurried past in colored blurs. Crabs and other unknown animals skittered away as I approached. Like flashes of memory or pieces of a dream not quite remembered, these creatures swirled around me in a thick blue world of constant motion. I felt both connected and unconnected, both foreign and familiar. I wondered what lay in that silent murkiness beyond my limited vision. I was aware of the abyss. Growing older I’ve become aware that there are portions of my self floating in the depths of primal and personal memory, relatively unexplored and perhaps unknowable, a sort of personal abyss. To many people the word “abyss” conjures up images of an eerie black-dark landscape lying at the bottom of the deepest oceans, a place of absolute silence and terrible cold, a place of impossible pressures inhabited by surreal creatures, a place to be feared. Yet for me there is also a deep and vast mystery associated with the abyss, and with that comes excitement, wonder, and the desire to explore. If the abyss threatens, it also entices. Our fear of the unknown, regardless of when and where it occurs in our lives, needs to be balanced by our need to embrace the mysteries and to simply explore. 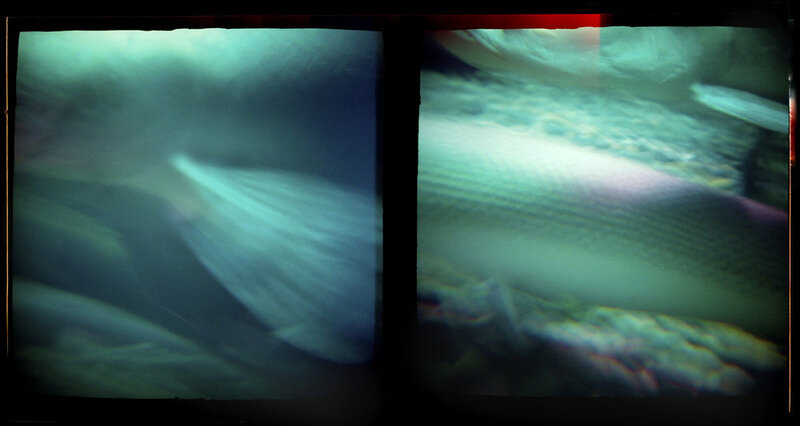 The Abyss series is a grouping of images made at public aquariums with a plastic toy Diana camera. While some might see the lens distortions and the lack of focus/exposure control inherent in this camera as limitations, to me they encourage the acceptance of chance, unconscious associations, and playfulness. The diptych format helps de-emphasize the focus on a specific animal, allowing the viewers to make their own associations. These images are not meant to be seen as literal photographic records of ocean life, but as figurative, metaphoric explorations of the abyss that is both out there and in us.